I had someone ask me "How do I do a water wall in 3D? ", and it got me thinking. There is no "right way" in 3D, and there is always more than one way to skin a rendering. It's all smoke and mirrors anyway. 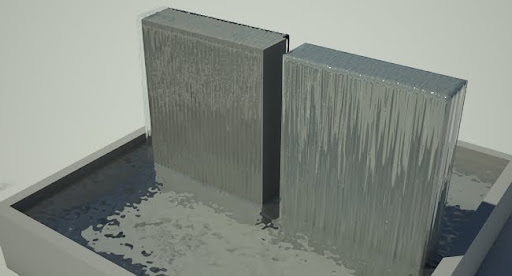 The two water walls in the rendering below were achieved with two different techniques. 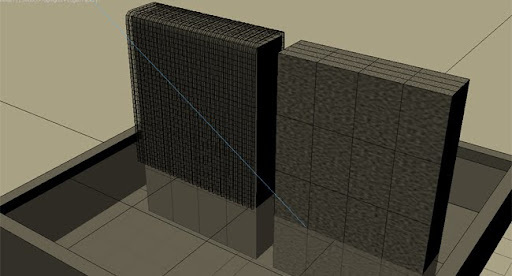 The wall on the left has a plane "draped" over the wall with a combination of a wave and bend modifier. The wave modifier creates the ripples in the water going down the wall. The bend modifier bends the plane to follow the curve of the walls. Be sure the plane has enough segments in both directions for the modifiers to work correctly. For this example my plane was segmented at 100x100. i like the one on the right more, seems cleaner and less uniform. the only downside to it is that you can notice that it's flat and not rippled by water on the edges so i'd combine both techniques. cheers! Oh man, this is perfect! Great job! The one on the right does look better. I used that technique on a waterwall I'm working on, only I'm trying to animate it so the water looks like its flowing down the wall...which is proving to be a difficult task. Any suggestions? You can try animating the noise in the bump map down in the Z direction. This should give you the movement you're looking for.